Joyce E. Bender, age 83, of Holland died Tuesday, October 3, 2017. 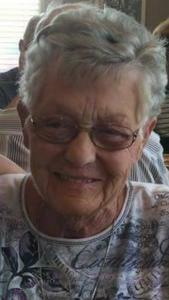 Joyce was a member of Calvary Church. She retired from Donnelly Mirrors in 1992. She enjoyed working at Evergreen Commons and was always helping older people. She was preceded in death by first husband Howard Menken after 50 years of marriage and her second husband Douglas Bender. She is survived by her daughter: Diane and James Stelter of Holland; grandchildren: Travis Bouwer of Chicago, IL, Christen and Shaine Rieley of Overisel, MI and Amber and Derek Zwiers of Big Rapids, MI; great grandchildren: Wyatt, Eleisa, Chase, Grace, Paul, Holly, Jonah, Lily and Brynn; sisters: Phyllis Reenders of Grand Haven, MI, Marian and Jason Wyngarden of Holland, MI and Patricia and Donald Bronkema of Holland, MI; sister-in-laws: Doris Bell of Holland, MI and Jean Bell of Holland, MI; many nieces, nephews and cousins. A funeral service will be held at 11:00 am, Saturday, October 7, 2017 at Calvary Church, 400 Beeline Road in Holland. Reverend Dr. J.D. Punch will be officiating. Burial will be in Lakewood Cemetery. Visitation will be from 6-8 pm, Friday, October 6, 2017 at Dykstra Funeral Home – Northwood Chapel, 295 Douglas Avenue in Holland. Memorial contributions may be given to Hospice of Holland.